In patients with lymphoma, FLCs may be produced directly by the tumour or by B-cells in the surrounding microenvironment. In diffuse large B-cell lymphoma and Hodgkin lymphoma, elevated sFLCs are associated with inferior event-free survival and overall survival. IgM Hevylite® is a novel prognostic marker in diffuse large B-cell lymphoma, predicting inferior outcomes in patients with abnormal IgMκ/IgMλ ratios. In mantle cell lymphoma, an abnormal sFLC ratio at disease relapse is associated with significantly worse overall survival. Figure 31.1. Frequencies of NHL subtypes in the UK. Red: B-cell NHL; Blue: T-cell NHL; others: Lymphoproliferative disorders not otherwise specified. Figure based on Haematological Malignancy Research Network (HMRN) data for 2004-2011 . (Produced with permission from Cancer Research UK). Lymphoma is a type of cancer that originates in the lymphatic system. There are two main types: Hodgkin lymphoma (HL) and non-Hodgkin lymphoma (NHL) . HL is less common and tends to affect the lymph nodes in the head and neck. It is distinguished from other types of lymphoma by the presence of Reed-Sternberg tumour cells . NHL constitutes approximately 90% of lymphoma cases, and can affect any lymph node or related tissue in the body . NHL is the sixth most common cancer in the UK, accounting for 4% of all new cases . NHL is not a single disease, but comprises more than 60 subtypes that have distinct morphology, immunophenotype, genetic, molecular, and clinical features . 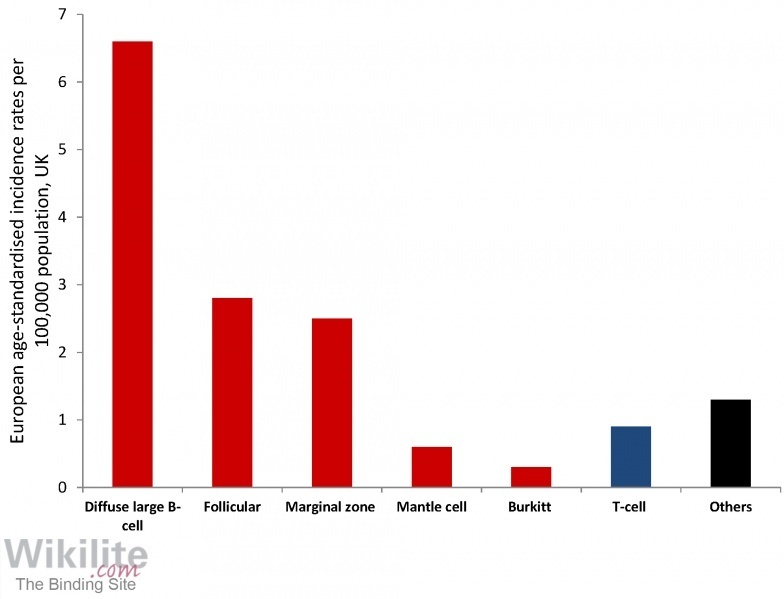 NHL is broadly divided into two major groups: B-cell lymphomas and T-cell lymphomas. B-cell NHLs account for approximately 85% of all NHLs and are discussed further below. Diffuse large B-cell lymphoma (DLBCL) is the most common form of NHL, accounting for up to one-third of cases. The frequencies of the other major NHL subtypes are summarised in Figure 31.1. This chapter discusses the role of serum free light chain (sFLC) and immunoglobulin heavy/light chain (Hevylite, HLC) analysis in HL and NHL, with the exception of Waldenström’s macroglobulinaemia, which is discussed in Chapter 32, and chronic lymphocytic leukaemia (considered part of a disease continuum with small lymphocytic lymphoma), which is discussed in Chapter 33. Conditions associated with increased lymphoma risk, such as solid organ transplantation and HIV infection, are covered in Chapter 35.